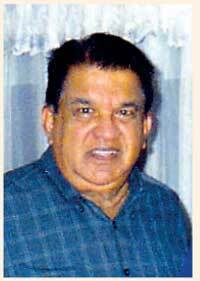 The sad news of Prof. E.G.de Silva’s demise reached me only a few days ago. On March 29, 2016, he had peacefully passed away at the ripe age of 90 in Pittsburg in the U.S.A., where he lived almost half a century. He used to visit Sri Lanka with his wife on a regular basis, and spend four or five weeks with his relatives, friends and pupils, enjoying their company. He relished meeting them over a dinner, a lunch or a cup of tea, engaged in going down memory lane and cherishing the good old times. I last met him at the Borella residence of his niece and nephew, Dr. (Mrs) and Dr. Warnakulasuriya, where the couple enjoyed the best of hospitality. Unfortunately, he had to cut short his stay and return early due to ill health. However, before his departure, he told me that he would come back once he got well. But, he could never make it. Prof. de Silva, better known as Greg among his close associates, hailed from a respectable family in the Southern city of Matara where he had his primary education; before coming to Colombo and getting admitted to the reputed St. Joseph’s College in Maradana. After his schooling at St. Joseph’s, he entered university and obtained his first degree. During his tenure of office in the Department of Social Services, Greg had the good fortune to proceed to the States on a scholarship for further education in Social Work, a discipline not known to the universities here at the time. At the School of Social Work of the Cathedral of Learning in Pittsburg, he excelled in his studies and passed out with a Masters, having obtained AA in all his subjects. On his return, the country had only three MM.S.Ws. Back at the Department of Social Services, Greg was entrusted with the onerous task of establishing a centre for professional social work education, a new field to Sri Lanka then. With his colleague Mr. Nadarajah, MSW, he gladly took up the challenge with courage and strength, committing himself fully to the noble mission. This was a turning point in his public service career. An administrator turned an academic. Greg, with the assistance of several others, managed to develop the curricula necessary for a course of studies leading to the Diploma of Social Work. Within a short a period of time, things were in place and the Ceylon School of Social Work saw the light of day in 1964. With the intake of the first batch of thirty students, the school began conducting classes at a rented building at No.82, Fifth Lane, Colombo 3. The course of studies was an intensive two- year programme. Greg and Nada jointly managed the school. The former was primarily responsible for all academic matters while the latter basically looked after the administration, of course with involvement in teaching too. Since the school did not have a permanent academic staff, Greg with his influence and numerous contacts spread over the academic and intellectual circles, managed to coordinate with the universities and other relevant authorities to procure the expertise required to conduct the lessons. In the process, the students too had an excellent exposure to the academia and intelligentsia of society, for which Greg deserved full credit. The role Greg played in finding placements for the sophomores was also remarkable. Greg’s contribution towards the establishment of the Ceylon School of Social Work and its operation during the difficult teething years deservers much recognition, admiration and gratitude. Greg and Nada laid the foundation for the establishment of the CSSW which was the precursor to the high-flying National Institute of Social Development currently awarding not only Diplomas, but also Bachelors, Masters and the Ph.DD. too, on the cards. However, when a position fell vacant on the academic cadre, the Cathedral of Learning which knew the quality and calibre of their alumnus, invited Greg take up the job. This was the time the school and universities were on a tug of war regarding the school being recognized and further developed academically. Greg who thought he could do a more satisfying job at Pittsburg decided to accept the offer. In late sixties, he migrated to the States where he read for his doctorate, and achieved the pinnacle of success in his chosen field to become a fully-fledged University Professor. A loveable personality, Greg was a ‘family man,’ so much attached to home. He lived a happy and content life with his beloved wife Lidwin and three children Kumar, Sunil and Sumithra. There was dignity and charm of manner in his talk and action. His honesty and integrity were of the highest standard. With utmost commitment and devotion, he served the humanity and died peacefully, having his mission on earth satisfactorily accomplished. Dear Sir, may the angels trumpet you to the gates of heaven!